CHIP: What Happens To Children's Health Insurance Now? : Shots - Health News Ten states will start to run out of money for the Children's Health Insurance Program by the end of the year. Most states will be out of CHIP cash by the summer of 2018, if Congress doesn't act. 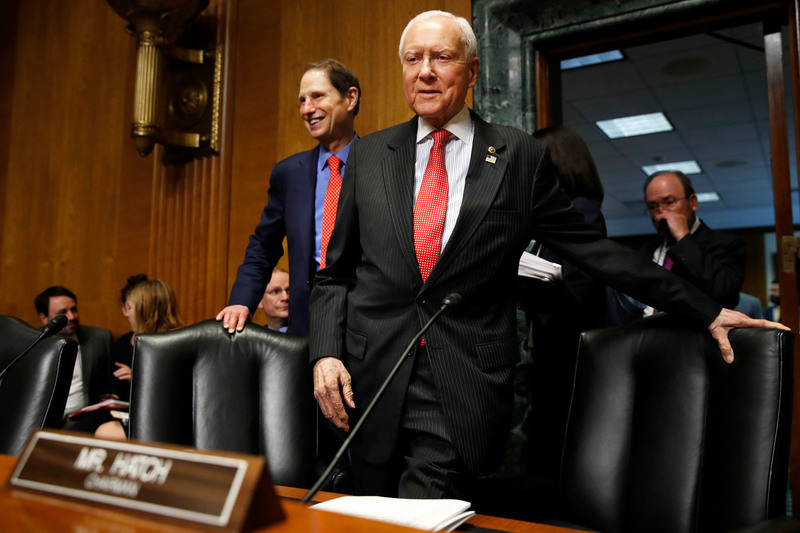 Senate Finance Committee Chairman Orrin Hatch, R-Utah, center, and ranking member Ron Wyden, D-Ore., have a plan to renew funding for the Children's Health Insurance Program, which lapsed Sept. 30. Though current authorization for spending has expired, states can use some of their unspent federal funding to continue their programs. Several states are expected to run out of money before the end of 2017, and most of the rest will run out by next summer. CHIP has been in this fix only one other time since it was established in 1997. In 2007, CHIP went weeks without funding authorization from Congress. Here's a quick look at what may lie ahead for the program. Will children lose coverage because Congress missed the deadline? They could eventually, but not immediately. A few states facing the most pressing threat — including California and Arizona — have enough funding to last only until the end of the year. What are states doing in response to Congress missing the deadline? Minnesota, however, was among the most imperiled because it had spent all its CHIP money. State officials said Tuesday that the federal Centers for Medicare & Medicaid Services was giving Minnesota $3.6 million from unspent national funds to cover CHIP this month. Emily Piper, commissioner of the Minnesota Department of Human Services, reported in a newspaper commentary Sept. 18 that her state's CHIP money funds would be exhausted last Sunday. Even without the last-minute cash infusion, most of the children covered by CHIP would have continued to receive care under the state's Medicaid program. But Minnesota would receive less fewer federal dollars for each child, according to Piper's commentary. However, she added, those most at risk are the 1,700 pregnant women covered by CHIP, because they wouldn't be eligible for Medicaid. Utah has notified the Centers for Medicare & Medicaid Services that it plans to discontinue its CHIP program by the end of the year unless it receives more federal money. About 19,000 children are in the state's CHIP program, state officials say. So far, though, the state says it's not moving to suspend service or enrollment or alert enrollees about any possible changes. Nevada officials say if funding isn't extended it might have to freeze enrollment on Nov. 1 and end coverage by Nov. 30. California, which has 1.3 million children covered by CHIP, has the highest enrollment of any state running out of funding this year. But, so far, it's continuing business as usual. "We estimate that we have available CHIP funding at least through December 2017," says Tony Cava, spokesman for California Department of Health Services. "Our CHIP program is open for enrollment and continues to operate normally." Oregon says it has enough CHIP funding to last through October for its program that covers 98,000 children. When is Congress likely to act? The Senate Finance and the House Energy and Commerce committees have scheduled votes Wednesday on legislation to extend CHIP funding. If both approve their individual bills, floor votes could come quickly, and then both houses would need to resolve any differences. Senate Finance Committee Chairman Orrin Hatch, R-Utah, and the committee's ranking Democrat, Sen. Ron Wyden of Oregon, announced an agreement in mid-September to renew CHIP funding. Under the proposed deal, federal CHIP funding would drop by 23 percentage points starting in by 2020, returning to its pre-Affordable Care Act levels. The agreement would extend the life of the CHIP program through 2022. Hatch and Wyden didn't provide any details on how they would pay for the CHIP extension. If CHIP is so popular among Republicans and Democrats, why hasn't Congress renewed the program yet? While CHIP income eligibility levels vary by state, about 90 percent of children covered are in families earning 200 percent of poverty or less ($40,840 for a family of three). CHIP covers children up to age 19. States have the option to cover pregnant women, and 19 do so. The program goes by different names depending on the state, such as Hoosier Healthwise in Indiana and PeachCare for Kids in Georgia.